I've long been a fan of silhouettes; in fact, a favorite souvenir from a trip we took to Disney World is this papercutting of our sons. Snip, snip, snip... in just a few minutes a talented artisan with a pair of scissors and a sheet of black paper accurately captured their likenesses. Fast forward twenty years or so to today's digital technology. 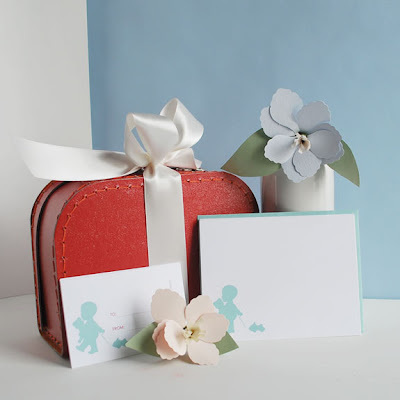 I came across Le Papier Studio and blog [no longer available] and knew I wanted to feature Vana Chupp's work. 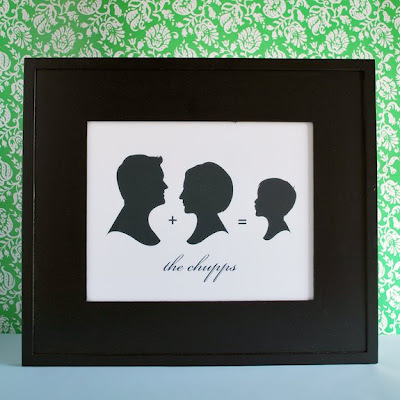 A graphic designer who specializes in digitally drawn silhouettes, Vana places the images on handmade personalized stationery, invitations, birth announcements, and even pillows and totes. 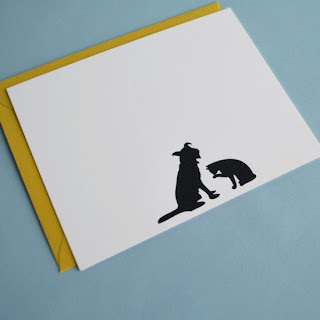 She offers so many beautifully presented options... these little notecards, for example. Perhaps the paper flowers played a part in capturing my attention?! The cards come packaged in the little paper suitcase, by the way. I love this modern take on a family portrait. 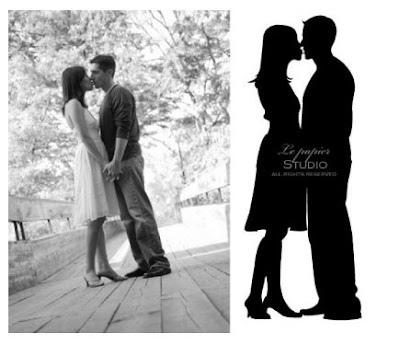 Something very special that Vana can do is a custom silhouette based on your photograph. And lest you think the cost for something so unique is prohibitive, there's a one-time $10 fee for each custom silhouette. What a perfect image for an engagement announcement or save-the-date card. Of course pets can be featured too. 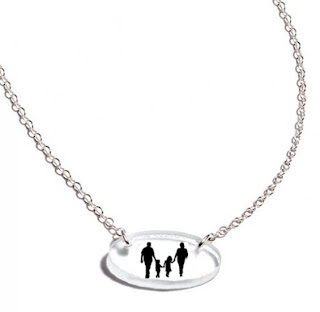 And finally, something brand new is a line of polished glass necklace pendants... the epitome of personalized elegance. In case you're wondering as I was, the images are sealed inside the glass... magical. I love the fresh take on a classic!